Santa Barbara Chocolate Company's California Collection is pure perfection! The care that goes into making the California Collection is meticulous and boy can you taste it! 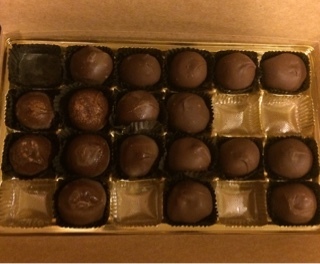 You know how you get a box of mixed chocolates and you bite into them trying to find a few that you like, well with Santa Barbara Chocolate Company's California Collection you won't have that problem. Each chocolate I bit into was absolutely delicious and there was no putting it back into the box once I tasted it's perfection. You can taste the premium chocolate in every bite! 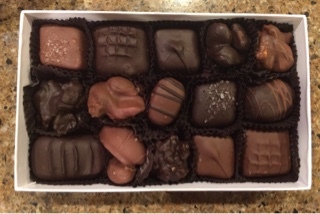 I highly recommend the California Collection to anyone who enjoys chocolates. They would also make a superb gift! Santa Barbara Chocolate Company's Milk Chocolate Covered Cherries are amazing! They're hand dipped and filled with a delectable cherry juice. You can taste the exquisite chocolate and cherry juice in every bite. The Morello cherry is the perfect compliment to the chocolate and tastes wonderful. I've never tasted a better chocolate covered cherry in all my life. These are amazing and I highly recommend them! I'm all about the chocolate but add a cherry to it and I need it! They look so delicious! Oh man. I LOVE chocolate covered cherries. I might be obsessed. I love Santa Barbara Chocolates! I have been a fan for years. I've never tried Santa Barbara. These look like a great teacher gift! Wow, that assorted box looks absolutely delicious! I've visited Santa Barbara a few times! Too funny! I think I'd probably have done the same. If moms happy I'm sure babies happy too so I side with the study. LOL! Thanks! I love chocolate too, especially the gourmet good kind like this! These chocolates look good I want to try them. These look really good. They would make a great gift for a loved one! You had me at chocolate. These look absolutely yummy. Thanks for sharing this awesome gift idea. I've heard of the SB chocolates before and they sound amazing! I'm definitely going to have to try them!